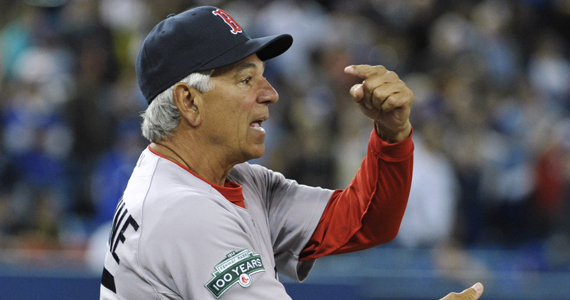 Jerry Ballgame grades the Red Sox 2012 season so far. A few weeks back, at about the 1/3 mark of the baseball season, Jobu did an insightful evaluation of the New York Yankees, and how they had perform up to that point. I remember thinking, “I suppose I should do one of those for the Red Sox.” But there were two basic reasons why I didn’t, starting with the obvious fact that there last place position in the AL East was rather self-evident as to how they were doing, the second was I was already doing progress reports for my students and didn’t feel like doing more. Yes, that’s right in my other life, I am a teacher and have been one since Richard Nixon lived in the White House. Now that school is done, I can turn my critical eye toward the Sox for assessments, both group and individual, and how it all relates to their season so far. I’m starting with Stamford’s own Bobby V., to whom I will give a solid ‘B’. Although he flunked some early tests, and has been surprisingly inarticulate when dealing with the media, he has, in general, handled a difficult situation reasonably well. He is getting particularly good grades from most observers as to the way he has developed and handled the bullpen. Fears persist that they will burn out over the second half, so don’t be suprised to see Daniel Bard back in the pen, sooner rather than later. Speaking of the bullpen, as it consists of Scott Atchison, Franklin Morales, Vincent Padilla, Andrew Miller , and Alfredo Aceves, it gets an ‘A-‘. They overcame early season issues, learned their roles, and have turned into the most consistent aspect of the ball club. Morales has been ‘stretched out’ to the point where he’s not just being counted on for long relief, but spot starting as well. Again, the fear of them burning out, combined with the failure of Bard as a starter, makes his return to the pen all the more likely, in my opinion. The starters. on the other hand, get a 75 (easy to dance to, but I didn’t like the words. Sorry. Just had an American Bandstand flashback.) A ‘C’ seems appropriate’, as in barely average. 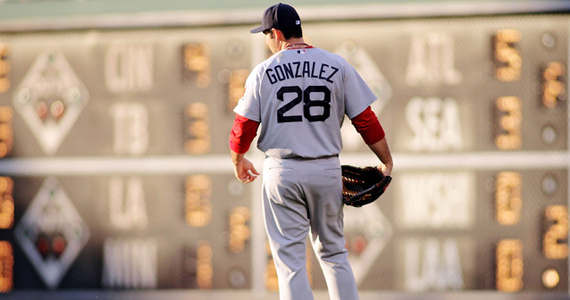 Felix Doubront (7-3) has probably been the most consistent and deserves a solid ‘B’, as does the 8-2 Clay Buchholz. Although no where near as consistent, he is starting to look like his old self. Jon Lester and the often injured Josh Beckett, both have four wins a piece, and have earned ‘C+‘ and ‘C’ respectitively. The failure of the Daniel Bard Exiperiment (sounds like the name of a band) brings down the overall grade to the previously mentioned ‘C’. Although Dice-K pitched well enough to get the win against the Cubs, and Morales looked sharp in his start, it’s too small a sampling to know for sure how they will impact the rotation. As for the infield, defensively I’ll give them a solid ‘B’, but offensively a ‘C’, maybe ‘C+”. The grading in through here gets a little confusing as whether or not you include Adrian Gonzalez as an in- or an outfielder, and David Ortiz as a an infielder or a DH. I suppose they cancel each othe out in a way, as Ortiz is having a strong season so far (.314) and Gonzalez is not (.257) Middlebrooks and Aviles on the left side have had pleasantly surprising years to date, where Pedroia and Youkilis, because of injuries mainly, on the right side of the infield, have not. The outfield gets really interesting. I’m not sure I have enough space to list everyone who has played out there for Boston so far these season. Ryan Sweeney, Ryan Kalish, Cody Ross, Scott Podnesnik, Daniel Nava, Marlon Bird, and Adrian Gonzalez just to name a few. So far they have done a relatively decent job of it, earning perhaps a ‘B’ for their efforts; both defensively as well as offensively. Ross had some early season adjustment problems in dealing with the wall, and Gonzalez, as brave as he is, is still a much better first baseman. The lack of power from what are usually considered power positions makes a grade of a ‘B’ a bit generous I suppose, but they have been managing to get on base, so I’ll give them the benefit of the doubt. Finally, the catching duo of Kelly Shoppach and Jared Saltalamacchia, I would say, have earned ‘B-‘s, perhaps ‘B’s, for their efforts. Offensively, they have both delievered several key hits, with ‘Salty’ actually second on the team in home runs, with 12. Defensively, they seem to be handling the staff OK, but at times have trouble with the running game. FINAL GRADE: B- : Although a tad high for a last place team, I would say that’s a fair assessment of where the Red Sox are at the moment. I believe it underlines two main points. For one thing they are in the toughest divison in the American League, if not all of baseball, and would likely battling out for second place instead of tying to escape the basement, if they were located elsewhere. It also proves that individual performances, if not balanced or timed properly, do not necessarily lead to team success. Timing, as the saying goes, is everything. For as Josh Beckett said, “Sometimes we pitch good, but don’t hit good, and sometimes we hit good, but don’t pitch good.” Beckett may not have been an English Major, but he was right about that. One has to believe, that if the Sox can’t find their ‘A’ game soon, then they better get used to life in the back of the pack.